I bought my goldfish in 2001. Recently the male developed a reddish splotch on his back – in the photo you can see it above and to the right of his gill. In all honesty, I didn’t know he was the male until I got the two goldfish a much larger aquarium and a constant dance of chasing began, Male chasing, female being chased is how it breaks down. When I took out the old water and replaced it with fresh, filtered water I saw that this goldfish, which is a lighter color overall, had a reddish splotch. 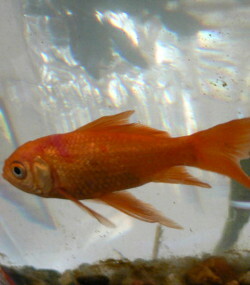 The other goldfish also had splotches, but not as large or intensely colored in comparison to her overall coloring. My first thought was that they were more brightly colored because they were ready to mate, but I worried that was pollyanna optimism. I Googled “Red splotches on goldfish” and found that it can be caused by too much food making the water’s ammonia content too high. That certainly could be it, because last fall a woman who was helping me in my house went over to the fish and asked them, “Are you hungry?” She then picked up my food container and fed them. I didn’t feel comfortable with her doing that, but I found that she made me feel guilty about not feeding my fish enough, so since then I was feeding them a very great deal more. That was despite Kathy, whom I had worked with at a small hotel, telling me that the main killer of goldfish was overfeeding. 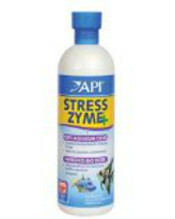 Last night I fed them an amount more like that I used in the past, and I changed the water again today, adding Stress Coat and Stress Zyme. But, the internet also suggested that it could be from an infection caused by the water having been dirty for an extended period. So, I took out the plants that were making the most algae, and I made sure to get out all the dead plant leaves. Usually the fish huddle together at the bottom after I clean their water, but this time they seemed to be enjoying the fresh water from the get go: they began swimming around so actively I felt as if they were playing. However, the red splotches are still there, on each of the two fish, so although I will clean the water again tomorrow, and put in fresh Stress Coat, I’m wondering about ordering some antibiotic. (I haven’t driven since I got tetanus in 2004 because of the muscle seizures, and later because of how debilitating tetanus is.) The man I hire to drive me is not usually available on the weekend, so ordering may be best. that guilt contributed to them getting sick, because I didn’t want to look at them, and without looking at them, you can’t see how they are doing. First ~~ While it was probably worthwhile to tell me that goldfish need a lot of room, I think making people feel guilty is counterproductive most of the time. For one thing, stress is a primary cause of depletion of vitamin B12. When people run low on vitamin B12 they have an increase in pain, a reduction in cognitive function, a loss of balance, and many other problems that make it less likely they will perform well, and more likely they will lose their temper or on the other hand become extremely depressed. For these reasons I wondered about an antibiotic that also contains B vitamins. Second ~ While I had tetanus I had fine red lines under my fingernails and thick red lines under the toenail of the toe I had injured. 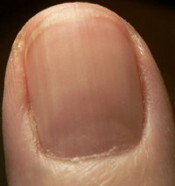 Lines like that are called “splinter hemorrhages” and are associated with a blood infection. 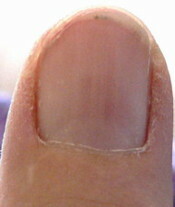 A few years later I was getting dull red splotches under my nails due to an ongoing infection that I keep in check by using vitamin C.
All of this gives the impression that living organisms share in how ill health affects them… that’s you and me, fish, animals and most likely insects. I hope to be able to report that my goldfish are healthy again in the very near future. 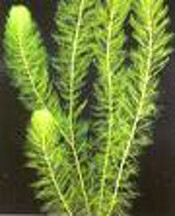 This is a picture of Foxtail, one of the plants that makes a lot of algae. It is a coarser plant than Limnophila, but overall I have a hard time telling them apart. 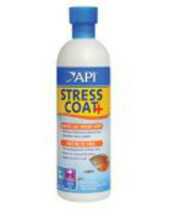 This is the one, I think, that was in with my fish when they got sick. This is a picture of Limnophila. My fish didn’t appear to dislike it as much as they disliked the Foxtail. But, it was quite invasive and also made a lot of algae.